What's the correct size of Galaxy Note 5 SIM card? How to install SIM card for Galaxy Note 5? How to remove SIM card from Galaxy Note 5? Galaxy Note 5 uses the sealed-body design. So, the SIM card slot is not under the back cover as in previous generations of Galaxy Note devices. Actually Galaxy Note 5 SIM card slot is located on the top of the phone (see Galaxy Note 5 layout). This is similar to Galaxy S6 edge and Galaxy S6 edge+. In addition to the new location, Galaxy Note 5 also uses a SIM card tray to hold the SIM card. You have to eject and pull out the Galaxy Note 5 SIM card tray to insert or remove SIM card for Galaxy Note 5. Galaxy Note 5 also uses SIM card with different size from Galaxy Note 4 and other Note devices. This guide will show you the correct SIM card size for Galaxy Note 5, how to insert SIM card for Galaxy Note 5 and how to remove SIM card from Galaxy Note 5. What is the correct Galaxy Note 5 SIM card size? Full-size SIM card. It has the size of a credit card (85.60 mm *53.98 mm*0.76 mm). You cannot find it now. Mini SIM card. This is now often referred to as big SIM card. Some old smartphones are still using mini SIM card. Its actual size is 25mm*15mm*0.76mm. The first generation of Galaxy Note uses mini SIM card. Nano SIM card. This is currently the smallest SIM card for smartphones. It is both smaller than micro SIM card, and thinner (12.3mm*8.8mm*0.67mm). Galaxy Note 5 uses nano SIM card. So, the correct Galaxy Note 5 SIM card size is nano SIM. You cannot use SIM card in Galaxy Note 4 (or Note 3, or Note II) in Galaxy Note 5! Because nano SIM card is thinner than Micro SIM card, it is NOT recommended to trim micro SIM card to nano SIM card. You should try to get the official nano SIM card from your carrier. A lot of carriers now offer 3-in-1 SIM card (mini, micro and nano). Please make sure you have a nano SIM card before proceeding. Inserting a wrong size SIM card may damage Galaxy Note 5 SIM card slot. How to install/ insert SIM card to Galaxy Note 5? Step 1: Loosen Galaxy Note 5 SIM card tray. You need insert the ejection pin (which can be found in the box of your Galaxy Note 5) to the hole. Gently push it to the end. The SIM card tray should be ejected a bit. Please make sure the ejection pin is perpendicular to the hole. Failing to do so may damage you Galaxy Note 5 SIM card slot. Step 2: Pull out Galaxy Note 5 SIM card tray. Now, you can gently pull out the SIM card tray from the Galaxy Note 5 SIM card slot. You should pull it out only when the tray is ejected a bit. If not, try to press the ejection pin slightly harder. Never try to pull the Galaxy Note 5 SIM card tray violently or with any tools. Step 3: Install/ insert SIM card. Put your nano SIM card into the empty/hollow area with metal part facing downwards. Actually, if you match the shape of SIM card with the hollow area, the metal part of your SIM card must be facing down. Make sure the nano SIM card is perfectly fitted into the hollow area. You can only use nano SIM card on Galaxy Note 5. Using other SIM cards will damage the Galaxy Note 5 SIM card slot. In most regions, the damaged Galaxy Note 5 SIM card slot or damaged Galaxy Note 5 SIM card tray is not covered by Samsung warranty. Step 4: Insert SIM card tray into Galaxy Note 5 SIM card slot. If you SIM card cannot fit into the hollow area perfectly, you should remove the SIM card. Only when the SIM card fits into the hollow area perfectly, you then insert the SIM card tray into Galaxy Note 5 SIM card slot as shown below. You may need press it gently to get the tray locked properly. Never insert Galaxy Note 5 SIM card tray violently. How about Galaxy Note 5 dual SIM models? The SIM card slot location for Galaxy Note 5 dual SIM models is identical to that in normal Galaxy Note 5 mentioned above. The major difference is that the SIM card tray has 2 hollow areas for you to fit 2 SIM cards as shown below. If you are going to use one SIM card only, put SIM card in slot 1. If you are going to use two SIM cards, slot 1 is for primary SIM card. How to remove SIM card from Galaxy Note 5? Step 3: Remove SIM card as shown below. Please note, Galaxy Note 5 can work without SIM card. Of course, if there is no SIM card, you can only use WiFi for connection. Is Galaxy Note 5 SIM card tray identical to Galaxy S6? Although Galaxy S6, Galaxy S6 edge and Galaxy S6 edge+ use the similar SIM card tray, the dimension of Galaxy Note 5 SIM card tray is different from that in Galaxy S6. So, do not try to insert SIM card tray from other phones into Galaxy Note 5. Do you have any questions on Galaxy Note 5 SIM card? If you have any questions on Galaxy Note 5 SIM card or installing Galaxy Note 5 SIM card, please let us know in the comment box below. How can I set sim 2 number in my note 5? The phone number is assigned by your phone company. Did you check the orientation of the SIM card and the slot? The chopped corner should match. Visit service centre if you don’t have the tool. Some handphone shops may also help you on this. I have had problems with my SIM card saying invalded and locked. I haven taken this problem to the Sprint Store and it took sales person 3 SIMS to finally get one to work. Now, what can I do about this problem my galaxy5note is paid off. Please help me!! Not sure whether the issue is caused by sim card or the phone. Is it a new phone? Did you try other sim cards? You should visit local Samsung service centre if there are any hardware issues. Don’t waste time and money on this. If you need a dual SIM phone, get a dual SIM version. There are no easy ways to “convert” a single SIM version of the phone to dual SIM version due to difference in hardware and software. You need to find a vendor for it, or order it online. If I cannot find the tool do open the sin card tray, is there anything else that I could use? You can straighten a clip and use it. Just avoid very sharp needles. My note 5problem is i cannot turn on both sim..when i put sim 1 to 4G or everything my sim 2 no service..and when i put sim 2 to 4G,sim 1 no service..i open setting and try to on my “dual sim always on” cannot funtion..pls help me..
What happens if you do not specify 4G? You can let it choose automatically, then enable mobile data for one SIM card. Don’t set network type for individual SIM card. You can power off the phone, remove both SIM card, power on, wait a few mins, power off again, insert SIM cards, power on to clear old settings. Note 5 is dual standby only. In addition, only one sim card supports 2g/3g/4g. the other is 2G only. ciao ho acquistato il vassoio singolo per sbaglio,posso montarlo sul dual sim? Can I put a samsung sim card in an iPhone 5? For sim cards, phone doesn’t matter. But you need make sure the size of sim card is correct. For Galaxy Note 5 and iPhone 5, the sim card size is identical (nano SIM). For older Samsung phones, micro SIM card, which is bigger than nano SIM, may be used. Anyway, it depends on size of the sim card. My friend was trying to remove my Sim card from my note 5 and the pin he was using got broke off inside the pin hole and now I cannot remove the sim card. I live in BFE no where near any type of cell phone service center. I don’t even have a neighborhood geek squad to help me out. How can I remove the Sim card? If I remove the back cover will that help? The back cover is not removable for users. You should visit service center to get help. If it’s not convenient, you may check local phone repair shop. Hi I just bought the note 5 I tried inserting my nab sim card from the mobile and insert it in my note 5 tmobile phone it days sim card not found so I took out out tried it on a different phone sim card works went and got a bank card for note 5 works but it doesn’t work for other phone why? It is hard to understand what you wrote. You may write your questions in short sentences and tell us the exactly the error message. Punctuation goes a long way. I had damage to my screen on my Note 5 and sent it to Asurion and they sent a new phone. I took the nano sim card out before sending it back but forgot to wipe the phone yikes!. Worse yet I forgot to get my impotant saved Voice to Text (VTT) data that was saved on my old phone transferred to my email. I am wondering if anyone knows if the VTT info is on the sim card I removed from my old phone and if so, how to retrieve it? I don’t think such data are saved in SIM card. It should be saved as app data in phone storage. I think the service centre should wipe your data. They probably informed you already when sending the replacement. Can I take my nano Sim card out of my old note 5 and put it in my new one to receive photos, music,and contacts? Photos, music and contacts are NOT saved in SIM card. For photos and contacts, you can syn them through your Google account so that you can access them from any devices with your Google account. Is there any option to add micro sd card in note 5! !Does it have a micro sd card slot near mother board in back panel?? No, there is no SD card slot in Note 5. The back panel is not removable. For your media files, you can use USB OTG drive. Only one sim card can use 3G/4G. The other can only connect to 2G network. Slot doesn’t matter, although it’s recommended to put the 3g/4g sim in slot 1. Just want to know. On notification bar at simcard mode, why the simcard got love mode ? Not sure what you are referring to. You can take a screenshot and share it in our facebook page so that others can see it. hi, im from the uk and wanting to get the note 5. im on t mobile 3g network. if i order a t mobile nano sim from t mobile would this work in the note 5? currently note 5 is not going to be lauinched in the uk but im ordering one off the internet so my question is would note 5 worrk in the uk? 920i or 920c model? If the phone is unlocked, the 3G should work. 4G may not. Anyway, it’s better to order from local seller. Some local parallel importers may have more knowledge and give better suggestions. It may be painful if you get a phone without local warranty. Where can I buy a sim tray for my galaxy Note 5 64gb? Hi, Can I insert dual sim adapter on a single sim Note 5? As I know, no. 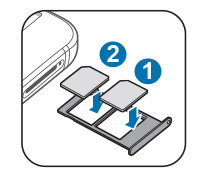 If the sim card slot is damaged, get a new one in the service center. For single SIM version of Note 5, you cannot use 2 SIM cards. But a company named magicsim from UK says so. How do you see that. I would not even try it. So I used to have a flip phone….. It was a Small SIM, but I’m not sure it will work… or would it? Probably not. I don’t think any flip phone uses nano SIM. You can check with your phone company to see whether you can replace the sim card to a Nano SIM. It’s NOT recommended to trim the card. Can I use my Note 4 Sim card in my Note 5? No, Galaxy Note 4 uses Micro SIM, while Note 5 uses nano SIM, which is smaller than Micro SIM. It is better to get the official nano SIM for your Galaxy Note 5. If not, you can try to trim it. Most handphone shops have the tool to trim it for you. Please note, you may damage the SIM card if you trim it wrongly. i use 2 sim card. sim 1 is 2g and sim 2 is lte,3g. i take mobile data on sim 2 and i also setting on my hp sim 2.so far there is no problem but lately i was curious if i use over internet data that i supposed to be in my sim 2 why my kredit on sim 1 were charge?? is i need setting my internet network to sim 2 not just setting my device? how? please reply me. In the dual sim settings, you need specify which one is for mobile data. Hi, Can I use my iPhone 6S’ SIM card in a Galaxy Note 5? I am on the Verizon network. Also, can I swap the SIM card back and forth between these 2 phones at any time? Thanks! Yes, both phones use nano SIM. When removing or inserting SIM card, you should power off the phone. Hi, I have a dual sim Note 5. I want to know how to activate both Sims. i want to be able to receive calls on Sim 1 or Sim 2 whilst any of the sim is busy. Please reply. What error did you get? Be default, both sim cards are activated once inserted. Hi, Thanks for your reply. Both Sim cards are active but when I make or receive a call on Sim 1 and when someone calls me on Sim 2, I don’t get that call instead it goes in my voicemail. I want to also know how to switch between Sims. Did you enable “Dual SIM always on” in Settings–SIM card manager? Please note, this feature uses call forwarding and your carrier may charge you for call forwarding. I’ve tried setting the dual sim always on but call forwarding option will fail on sim 2. When you are called on sim 2, what do you get? If I lost opener of sim card tray….what is alternative? You can straighten a clip (the one for paper) and use it. Do NOT use sharp needle. Did you try the sim card in other phones? Should I turn the phone off before inserting/ejecting the SIM card? Yes, you should power off the phone when inserting/removing SIM card. When you put the SIM card in, does all the functions of a normal phone like the Samsung gs6 work? For example, mobile data, calling? If your SIM card is activated and had such features, yes. Is the second SIM card slot capable of mobile data (3G/LTE) or for GSM only? For dual sim models, only one sim card is for 3g/lte. The other one will be on 2g. The sim card slot is not important as you can specify and charge quick one is for 3g/lte. How do you do this? Would like to switch between 2 sims for data plan usage. For galaxy note 5 dual sim, only one SIM card can use mobile data. By default, this is SIM 1. For some models, you can enable mobile data for individual sim card in settings – dual sim. Can sim card slot 2 use as microSD card slot? No. If your Galaxy Note 5 is a dual sim model, the slots are for sim card only. Inserting a micro SD card may damage the slot. Anyway, micro SD is not supported in Note 5. You can use OTG flash drive. My sim card fell off tray while I was trying to insert and is now stuck….help???!! Visit local Samsung service center. You should not try to pull it out forcefully if the sim card is stuck inside. hi! is there a difference with the network coverage for sim 1 and sim 2? i think i read somewhere that sim 1 is lte and sim 2 is 3g only? please confirm. Normally, it is better to use SIM card 1 for mobile data because most apps assume this. Will a Iphone 5s sim card work with the Note 5? I have tried to put my 5s sim card into the Note 5 (the sim fits) but I’m not getting a 4g lte signal. The phone cannot dial out or receive calls when I try to use it. Both phones are with AT&T. What could be the problem? It should work. Both iPhone 5 and note 5 use nano SIM card. Did you get AT&T icon? You may reboot the phone to see whether it helps. You can check settings- mobile network and specify AT&T. The sim card tray came out with out the sim card:( now it is stuck. You’d better visit local Samsung service center and check the SIM card slot. It mat be got damaged. Normally, you cannot pull out of the tray with SIM card left inside because the hollow area in the SIM tray is slightly smaller than the SIM card. But if you trimmed your SIM card by yourself, you may have problems.